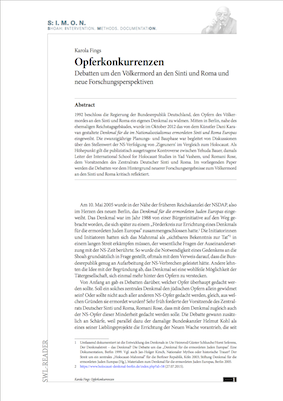 My research – through a history of the Budapest building managers (in Hungarian házmester) – asks to what degree agency mattered amongst a group of ordinary Hungarians who are commonly perceived as bystanders to the Holocaust. I analyse the building managers’ wartime actions in light of their decades-long struggle for a higher salary, social appreciation and their aspiration to authority. 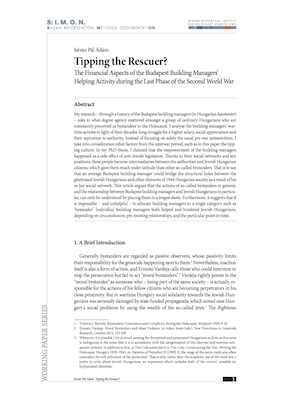 Instead of focusing on solely the usual pre-war antisemitism, I take into consideration other factors from the interwar period, such as in this paper the tipping culture. In my PhD thesis, I claimed that the empowerment of the building managers happened as a side-effect of anti-Jewish legislation. Thanks to their social networks and key positions, these people became intermediaries between the authorities and Jewish Hungarian citizens, which gave them much wider latitude than other so-called bystanders. That is to say that an average Budapest building manager could bridge the structural holes between the ghettoised Jewish Hungarians and other elements of 1944 Hungarian society as a result of his or her social network. This article argues that the actions of so-called bystanders in general, and the relationship between Budapest building managers and Jewish Hungarians in particular, can only be understood by placing them in a longue durée. Furthermore, it suggests that it is impossible – and unhelpful – to allocate building managers to a single category such as ‘bystander’. Individual building managers both helped and hindered Jewish Hungarians, depending on circumstances, pre-existing relationships, and the particular point in time. 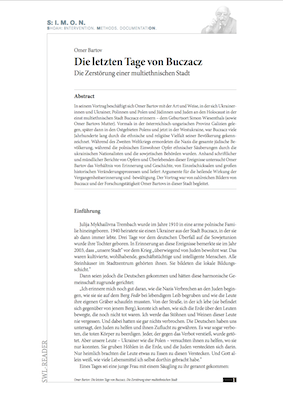 Download PDFOmer Bartov's presentation addressed the way in which Ukrainians, Poles and Jews remember the Holocaust in the formerly multi-ethnic town of Buczacz, where Simon Wiesenthal was born (as was Omer Bartov's mother). Buczacz is located in what used to be the Austro-Hungarian province of Galicia, then became part of Poland's eastern lands and is now part of the Western Ukraine. For centuries, it was marked by its population's ethnic and religious diversity. During the time of the Second World War, the Nazis murdered the entire Jewish population; the Polish inhabitants fell victim to ethnic cleansing by Ukrainian nationalists and Soviet authorities. 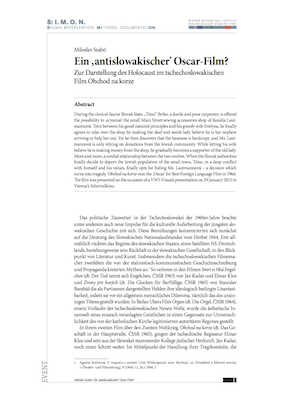 Omer Bartov used written and oral reports by victims and survivors in order to investigate the relationship between memory and history, between individual fates and grand historical processes of change. He argued for the healing effect of remembrance and coming to terms with the past. The presentation was accompanied by a wealth of pictures of Buczacz and of Omer Bartov's research activities in that city.